Today’s book (December 3rd) was It’s Christmas David! by David Shannon. Eileen got this for Christmas last year when it was very appropriate for her. This year it is VERY appropriate for Michael. This was a great read for both of the girls. Kaitlyn was able to read most of the words so it was fun for her to read it to us, and because of the limited text Eileen was great at helping us read the pictures. A very cute Christmas picture book. One of the scenes in the book is David sitting with Santa showing him his very long Christmas list. I thought this would be a great lead in to the girls writing their Christmas letters to Santa. We were going to decorate paper for our letters but Kailtyn really wanted to do hers all by herself and I thought lined paper would be a big help. I found some free printable snowman lined paper that was perfect. I sat with Kaitlyn and wrote her letter as she dictated it to me, and I helped Kaitlyn with a few words (spellings). I gave them some Christmas stickers we have to decorate their pages and envelopes. Fortunately there were no surprises for Mommy and all of the items they asked for were the same they told Santa 2 weeks ago when we did our pictures. 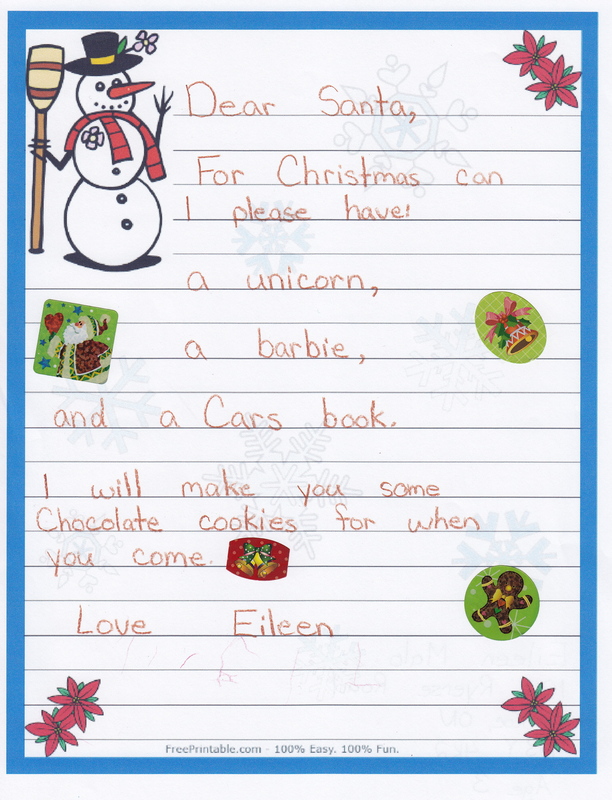 It was tough getting Eileen to add anything other than what she wanted for Christmas but eventually I convinced her to add that we would leave Santa cookies, even though I think she only added it thinking she might get to eat some. 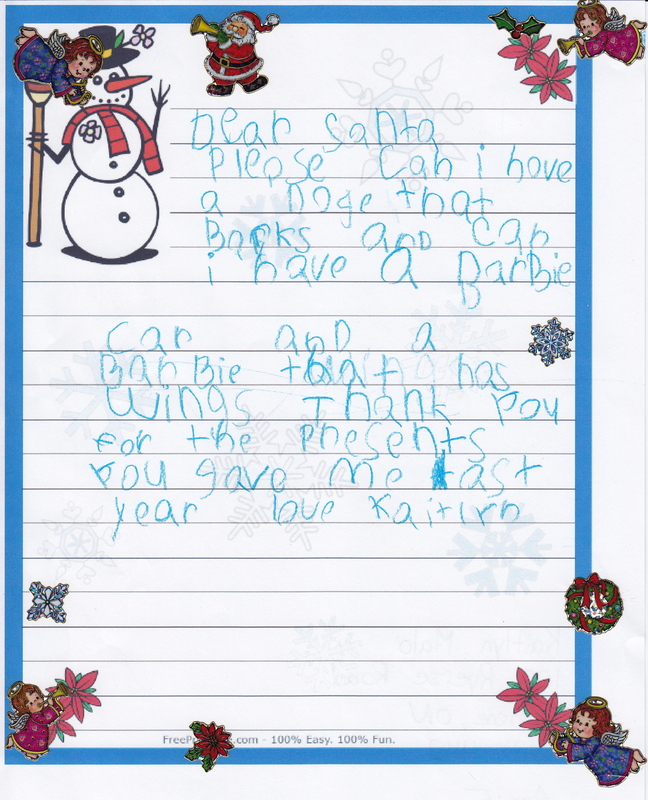 Kaitlyn was much easier and was very thoughtful and methodical with her letter. We will drop them in the mailbox on our way to church tomorrow and hopefully will get a letter back from Santa before Christmas! For a few weeks now we have been doing craft Thursdays. This week we are starting Literacy Tuesdays. Now don’t worry we really do literacy activities every day in our house. There are always books around my house, the girls have a number of ABC puzzles that Eileen is always in to, the number of workbooks and activity book we have is a bit scary, and they won’t go to sleep without their two stories each (one from Mommy and one from Daddy). There is also Kaitlyn’s work from school, so we are always doing literacy activities. 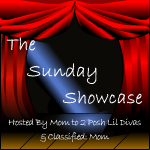 What we will be doing on Tuesdays are a variety of new and different activities just to reinforce literacy concepts – and most important they will always be fun. 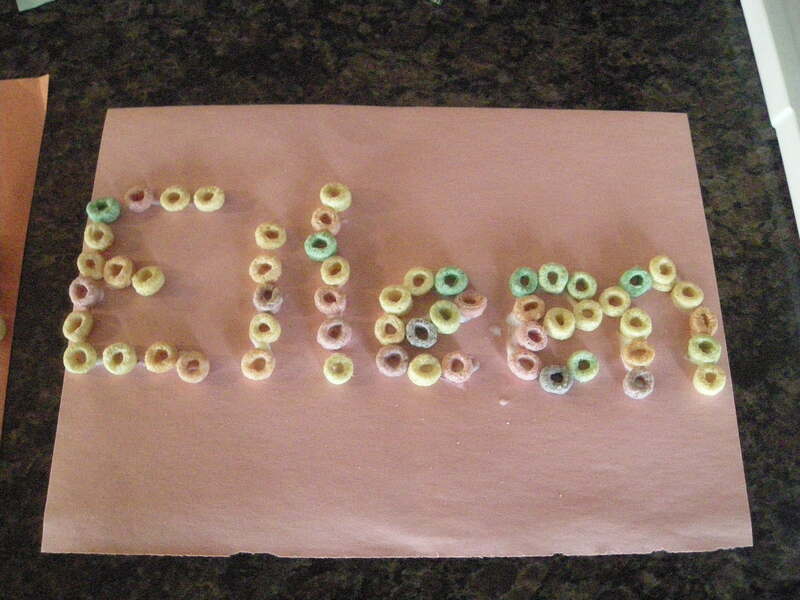 Today we did Fruit Loop names. We never have sugary cereal in our house so I was happy when Fruit Loops were on sale for 1/2 price at Sobeys yesterday. I may just have to give in and let them have a few for snack but the majority will be for crafts. 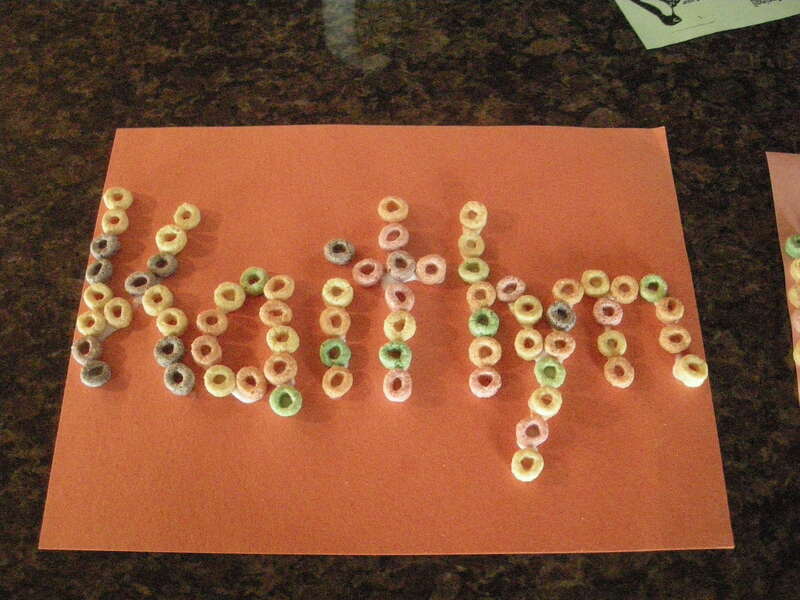 I wrote each of the girls names on a piece of construction paper and then they glued Fruit Loops over the writing. This time I wrote both of their names for them but I think we may try this again and have Kaitlyn create the letters of her name without following my writing.